The boundaries of the District were to be identical to those of the Town of Buena Vista. However, over the years, the boundaries have changed due to numerous inclusions into the District, which were not included in annexation to the Town. The District sets a mill levy every year and the members of the District are taxed accordingly. The taxes collected constitute a small portion of the District’s total revenues, approximately 6.5 percent. The main income for the District comes from monthly sewer charges which are set at a flat rate, septage charges, CDOC charges and sewer tap fees. In 2002, the District entered into an intergovernmental agreement with Chaffee County to allow persons in the unincorporated area known as Johnson Village to tap into the District main. Chaffee County formed an improvement district and constructed a collection system for Johnson Village which then discharged into the Buena Vista Sanitation sewer main. The rates for Johnson Village differ from the normal rates charged to members of the District. Johnson Village is not in the District boundaries. Our Special District includes Buena Vista, Colorado, and surrounding areas. 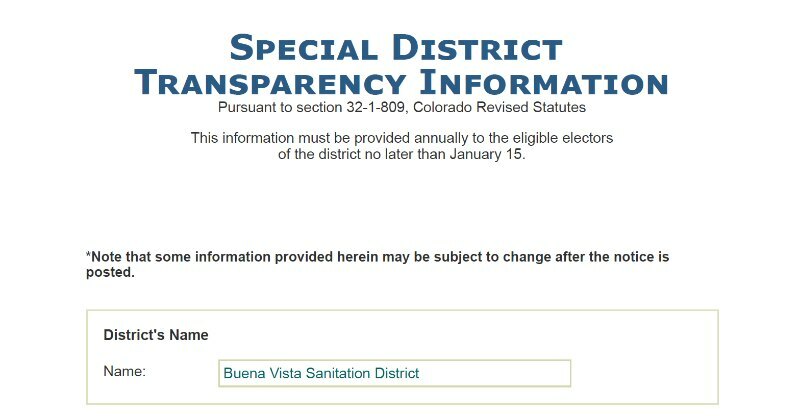 Pursuant to section 32-1-809, Colorado Revised Statutes for Transparency Notices may be filed with Special District Association of Colorado. This information must be provided annually to the eligible electors of the district no later than January 15 of each year. The unqualified opinion of our independent external auditors, BiggsKofford, is included in the Buena Vista Sanitation District Financial Statements for December 31, 2016 and 2015. It is their opinion that the the financial position of BVSD is in accordance with generally accepted accounting principles. The District’s financial position is strong. The current financial condition, staff capabilities, operating plans and upgrade plans to meet future wastewater quality requirements are well balanced and under control. The District is governed by five directors who are members of the District and are elected by electors of the District. These are 4-year terms. The Board of Directors of the Buena Vista Sanitation District will hold its regular meetings on the first and third Tuesday of every month at 6:00 pm, at the offices of the District at 26200 County Road 301, Buena Vista, Chaffee County, Colorado. At said time and place, the Directors will consider such matters as may be properly presented. Meetings are open to the public; please contact us if you’d like to be on the agenda. Meeting notices are posted pursuant to CRS 24-6-402(2)(c). Agendas for the meetings are posted at the Clerk & Recorder Office, 112 Linderman, Buena Vista, Colorado. Special meetings are also posted at the Buena Vista Public Library, the Buena Vista Post Office, and the Chaffee County Clerk & Recorder Office at 104 Crestone in Salida. Meeting minutes are available upon request.